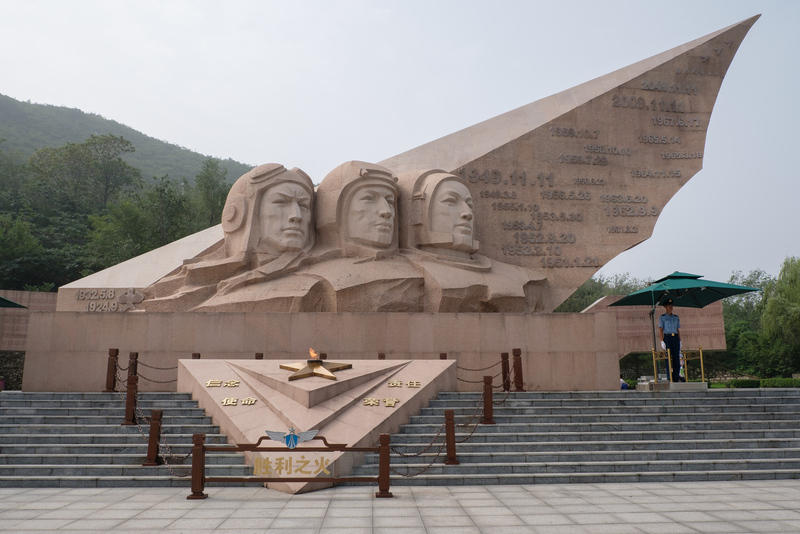 Last week, I visited the China Aviation Museum, while I was on a 30hr layover in Beijing. Although I'm not a huge fan of museums that only have static (non-flying) aircraft, this one had been on my radar for a while... Generally speaking, I much rather prefer "flying museums" like Planes of Fame and the Yanks museum in Chino, CA, which keep a number of aircraft in airworthy condition, but this one is definitively worth a visit. The biggest obstacle so far had been finding a reasonable way to get there! Given Chinese taxi drivers do not speak any form of English, explaining where one wants to go to, can be a challenge; especially since most people from Beijing are not familiar with the place. Of all places, it was through a recent post on Tripadvisor, that I found a reasonable way to get there; hopefully without getting lost. It consisted of a one hour metro ride from the city center, followed by a 20min bus ride! First, one needs to find his way to the "SAHE" metro station on the Changping line (pink); a relative easy task. Take the B1 exit and then follow the main road to the right for about 500m. Take the 945 bus (2 yuan - no change) which has a dedicated stop close to the entrance of the museum but which is not announced in English. I suggest using an app like "CityMaps2Go"; to keep track where to get off using a off-line GPS moving map! 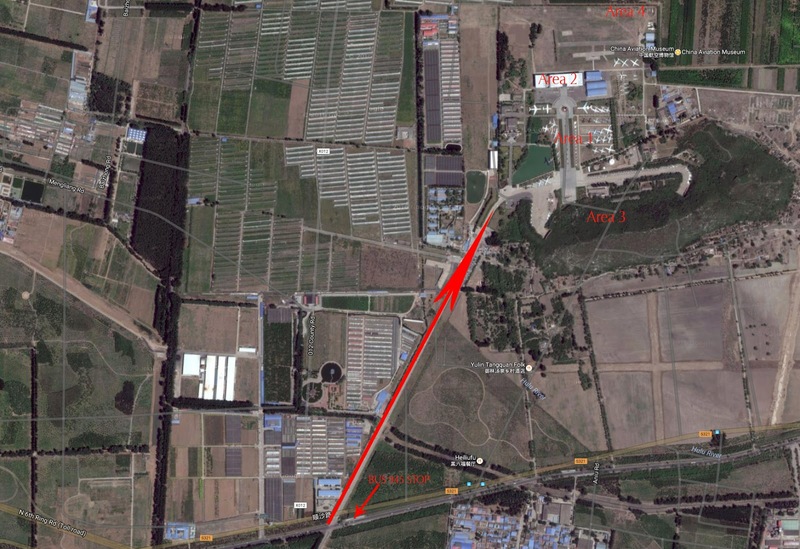 From the bus stop, one can walk the 1.5km along the "taxiway" which connects the nearby military airbase with the museum grounds, or can take a 10 yuan "tuktuk" ride. On a side-note, on the way over there I could not find the place where to get on the bus and ended up hiring a tuktuk. Giving him directions through my iPhone app, he wasn't really pleased when we ended up on the highway with the three-wheeler! But we got there... On the return, it became clear that I didn't walk far enough after exiting the station at B1! 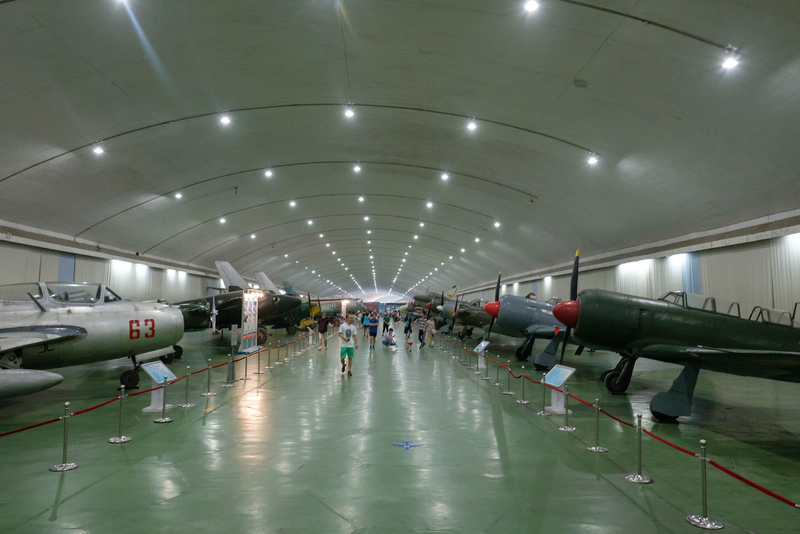 On entering the museum, one immediately comes to a large open space which is covered with a large variety of aircraft. 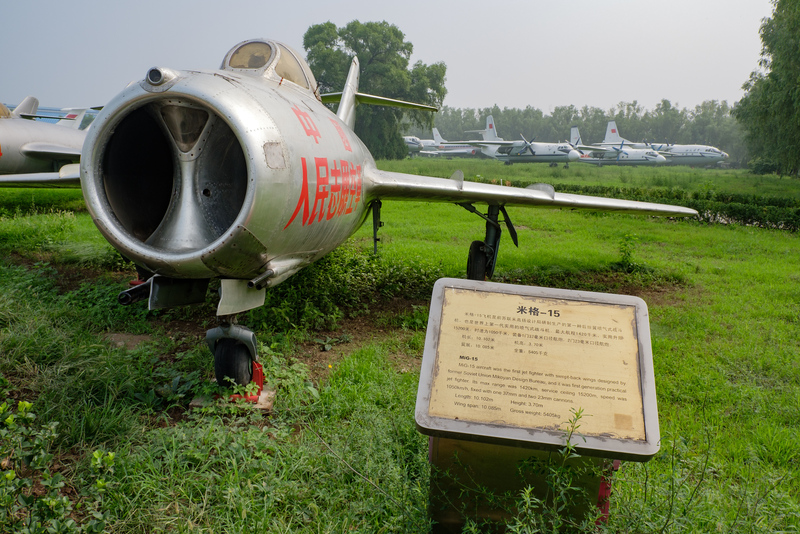 Some of the signs have some limited English translations, such as the one for this Mig-15 below. Although I can pretty much recognise most of the Worlds military and civil aircraft, my plane spotting skills proved to be a challenge here! 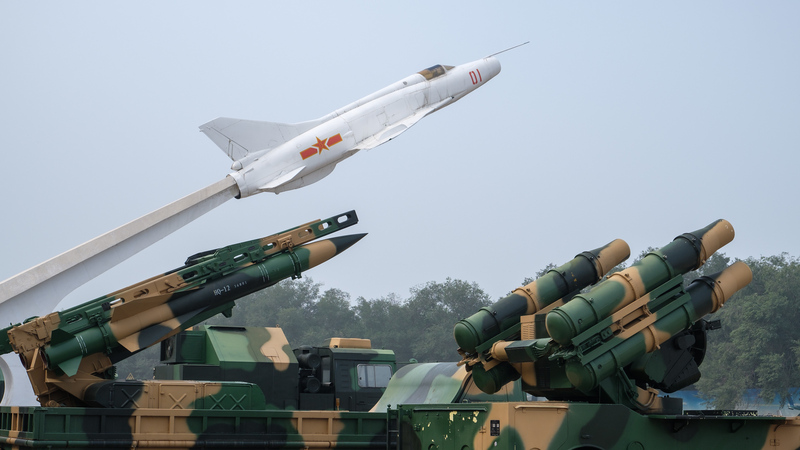 A lot of the aircraft are Russian (and even US) licence built and carry a specific Chinese designator. 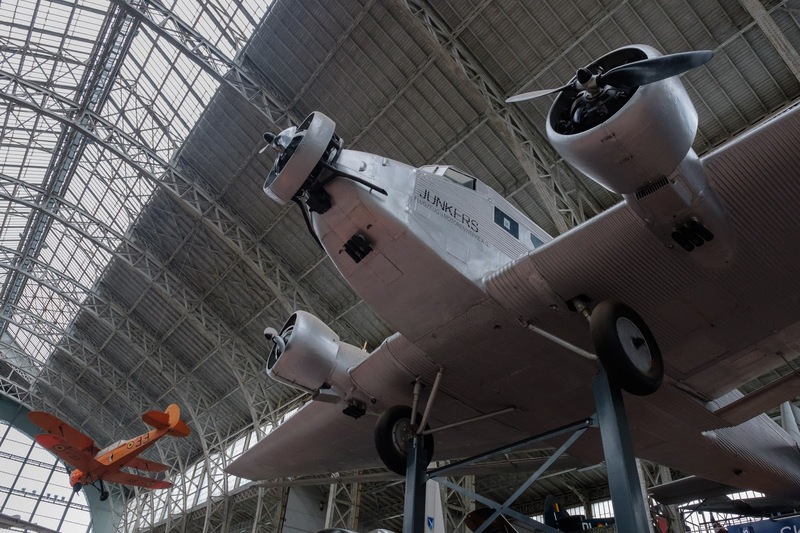 Typical for most aviation museums, they often want to cramp in too many aircraft in too little space; not great for photography. Although not different, it still proved to be worth paying the 20yuan (3,-USD) admission as there was a lot of interesting stuff on display. 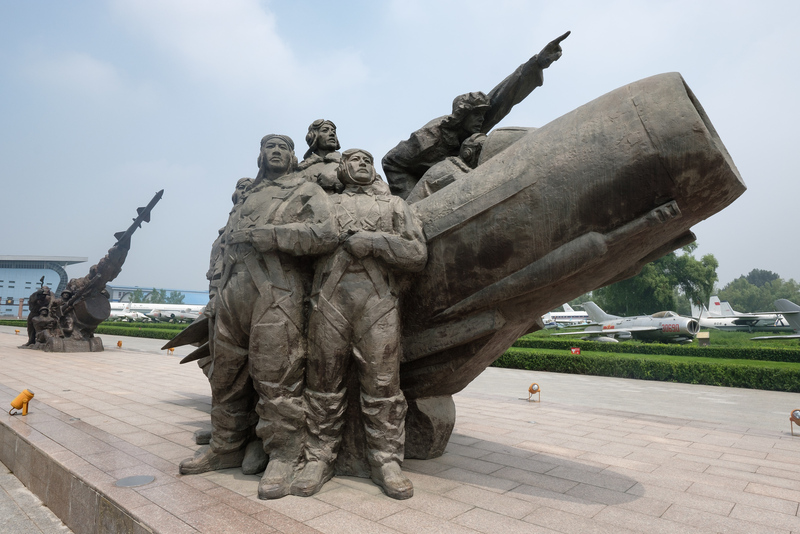 A Xian H-6A, license built Tu-16 bomber, dominates the scene. 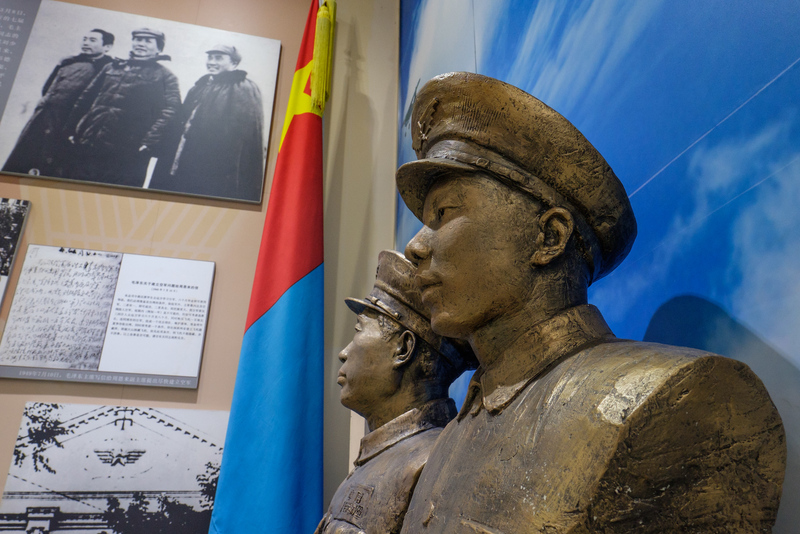 Although none of the signs inside the museum are translated in English, looking at the pictures, there seems to be also a bit of Cold War propaganda going on. 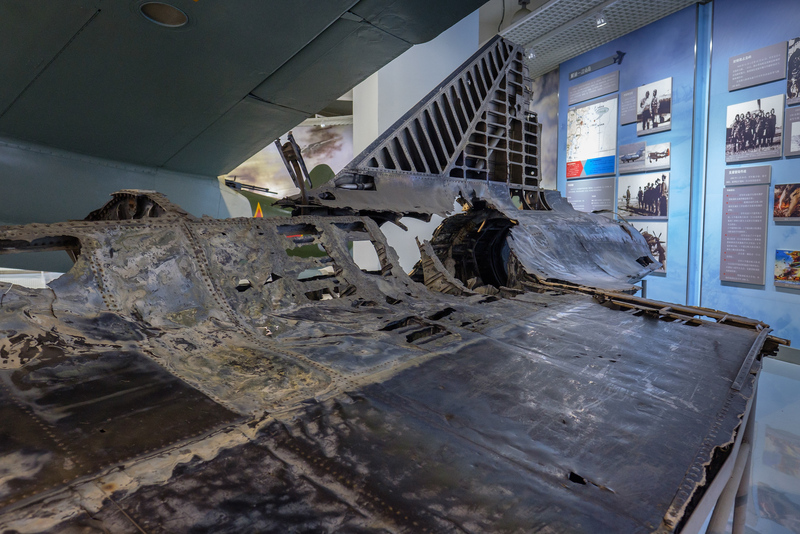 Such is probably the case with the display of the remains of this 1960's US Lockheed D-21 drone, which crash landed on Chinese soil! Probably the weirdest place of the museum is a 600m long tunnel with an entrance at both sides. 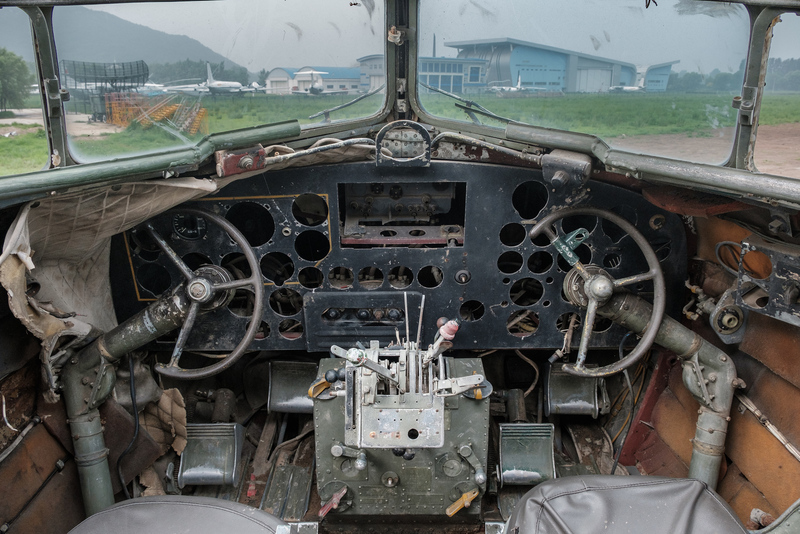 During the Cold War, it was used to keep aircraft safe, deep underground. The contrast with the hot and humid (around 30C) weather outside with the cold air inside the tunnel, was quite dramatic. One gets to the eastern entrance, by walking between 30 or so parked fighter jets along a wide taxiway; a nice photo-opportunity! 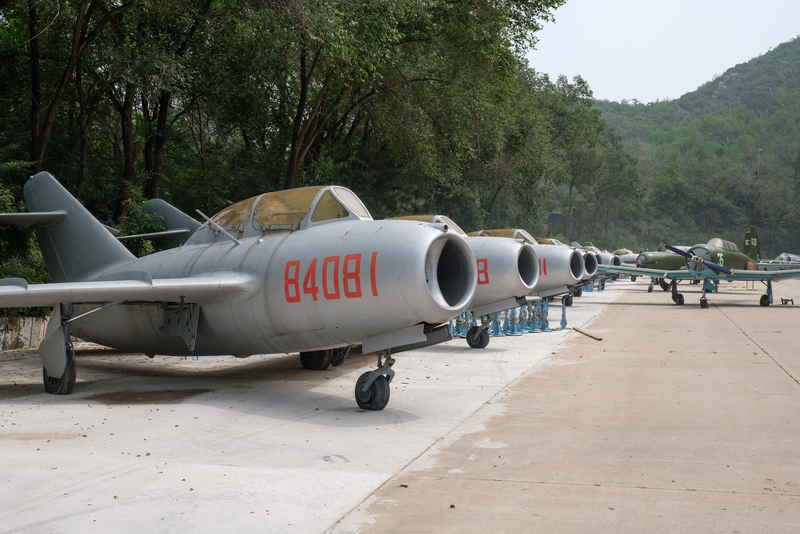 Inside there is a large variety (estimated around 60-70) of Chinese, Russian and Western aircraft from a WWII Mark XVI Spitfire through a YAK-17 (early 1940's jet) to an Italian F-104 Starfighter. The tunnel is extremely dark and not really suitable for photography; even shooting at ISO 6400 it remained a challenge! Likely the most interesting place is the graveyard to the North. 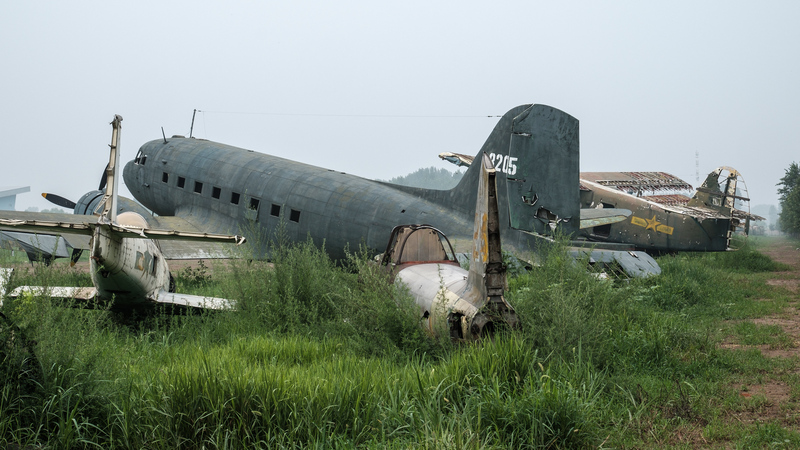 It has about 20 to 30 aircraft in a different states of disrepair and given it is isolated, is not really known by most of the visitors. 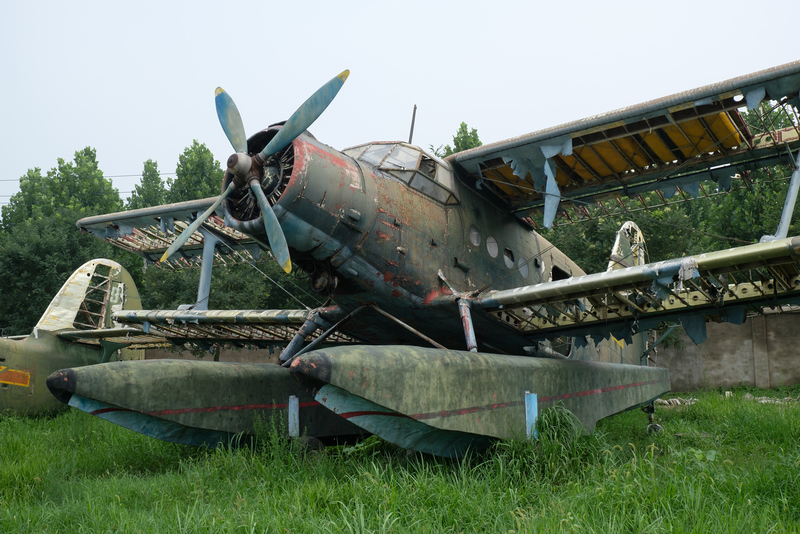 A rare bird was this Nanchang Y5-C; a Chinese floatplane variant of the Russian Antonov An-2. 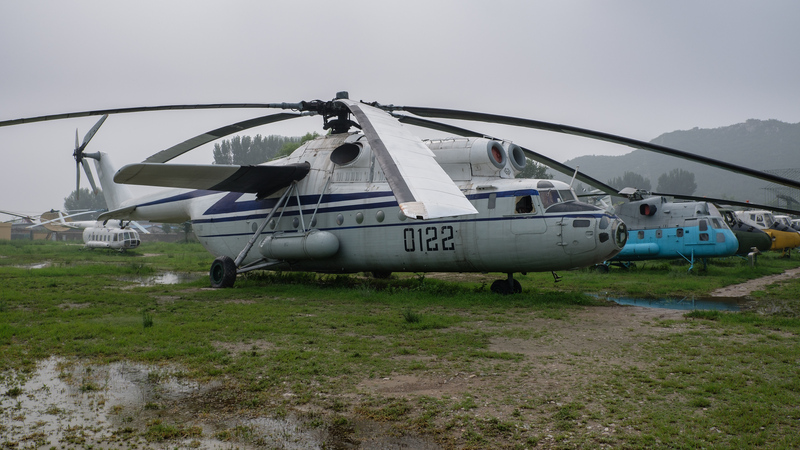 There is also a nice collection of Russian helicopters on display, next to the graveyard. 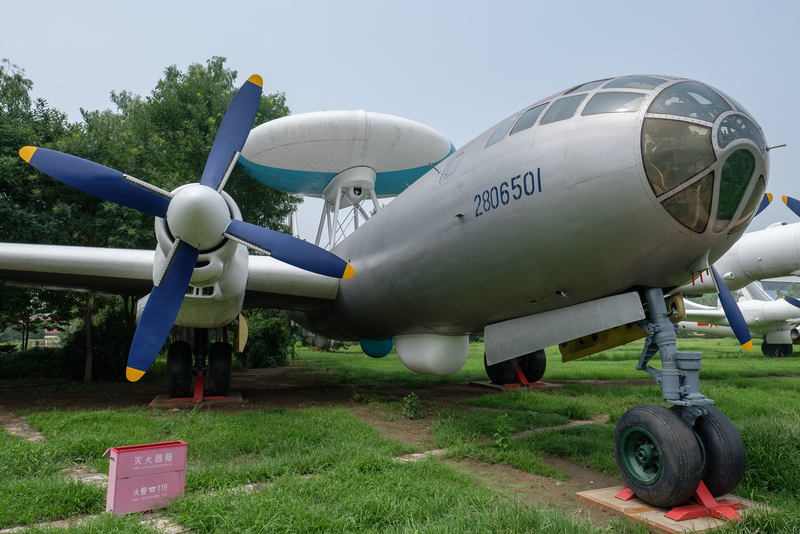 Visiting the China Aviation Museum, which is the largest aviation museum of Asia, turned out to be a great photo-adventure; something I would recommend to any Aviation Geek and/or photographer! One can easily spend 4 to 5 hours browsing through the different areas and I unlike myself I would recommend staying away from visiting during the hot and humid summer months (July-August). In any case, wear comfortable walking shoes, as one will easily walk +10km, if you check out all of the 300 or so aircraft on display. 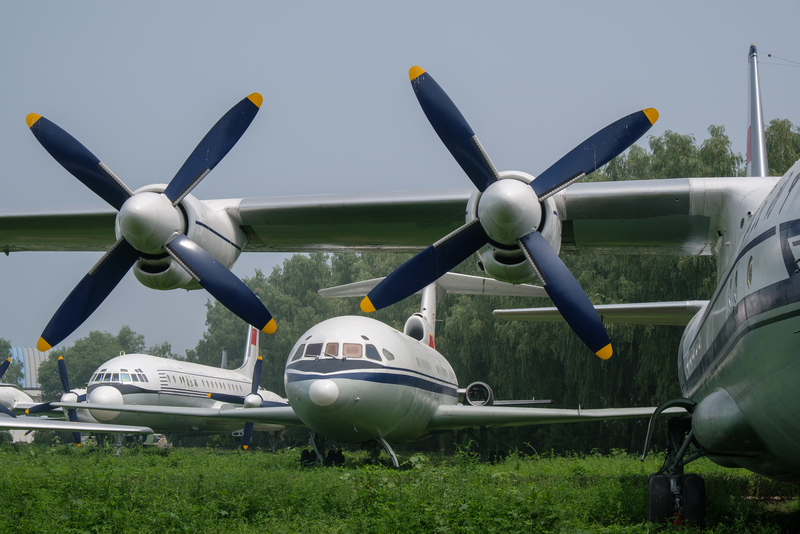 All of the published images of my trip can be found in the China Aviation Museum gallery. 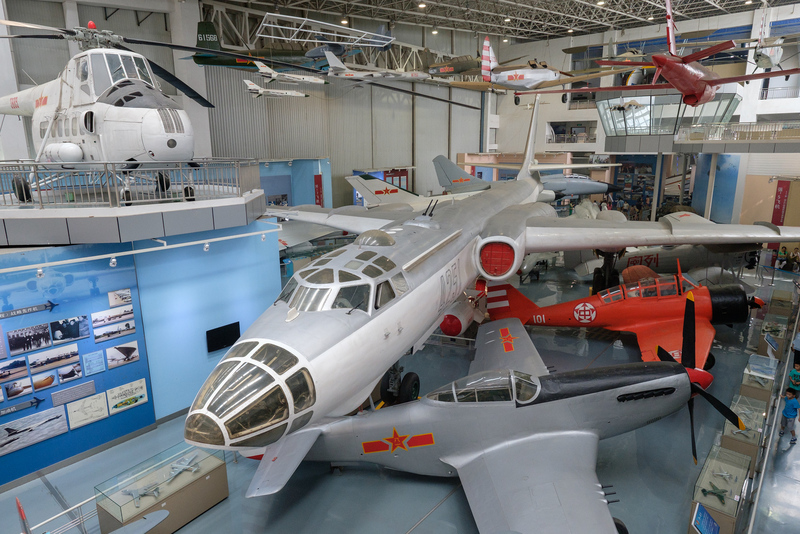 Although better maintained, the museum has a lot of similarities to the Russian Air Force museum in Monino, close to Moscow. A link can be found here. For you gear heads, all of the images were shot with the new Fujifilm X-T2; reviewed here. The much higher potential for recovering highlights and shadows, through a single RAW file on both the Fujifilm X-Pro2 and now also the X-T2, is something that came somewhat as a surprise to me! Although I was never unhappy with the potential dynamic range of the previous Fujifilm cameras (X-T1 and X-T10), the new 24.3Mpx X-Trans III sensor, really pushed this to the next level! The image below of the Dubai skyline, shot from The Terrace - Dubai Creek sales center, was the very first image I shot, 2 hrs after I picked up my pre-production copy of the X-T2 on April 21st. While I have made several bracketed exposures of the scene, I ended up using only a single shot as the basic exposure settings in Lightroom produced a very natural and satisfying result. As an illustration and comparison, I'm posting a low resolution "before" image of the original RAW file with no editing done to it. Overall, I feel Lightroom deals much better with X-Trans III (X-Pro2 and X-T2) files, much better than the with the previous X-Trans II files. It looks like I'll be using other RAW file editors like Iridient Developer, less with the new cameras. By the way, I'm almost always shooting Lossless Compressed RAW, as I struggle to see any differences with the double size uncompressed files. 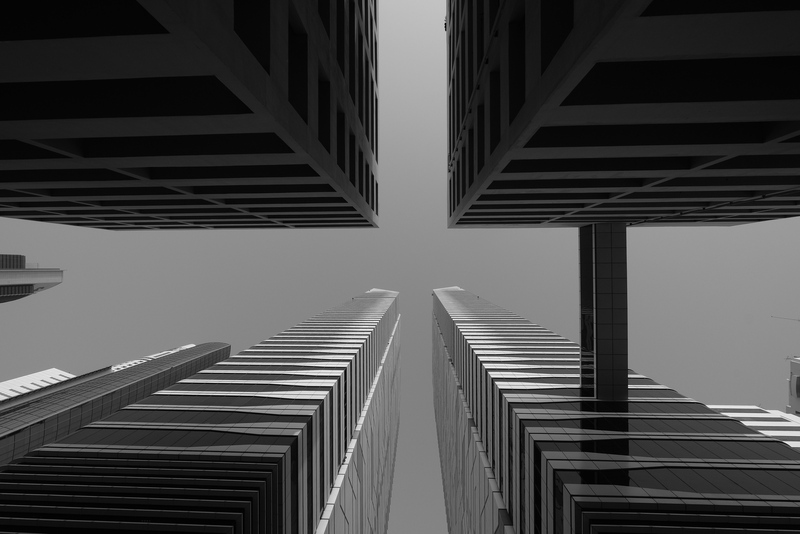 More of my Architectural work shot in Dubai can be found here. Pic(k) of the week 30: C A M E L R O A D, U.A.E. Since I received my preproduction Fujifilm X-T2 end of April 2016, I've accumulated a backlog of unpublished images... 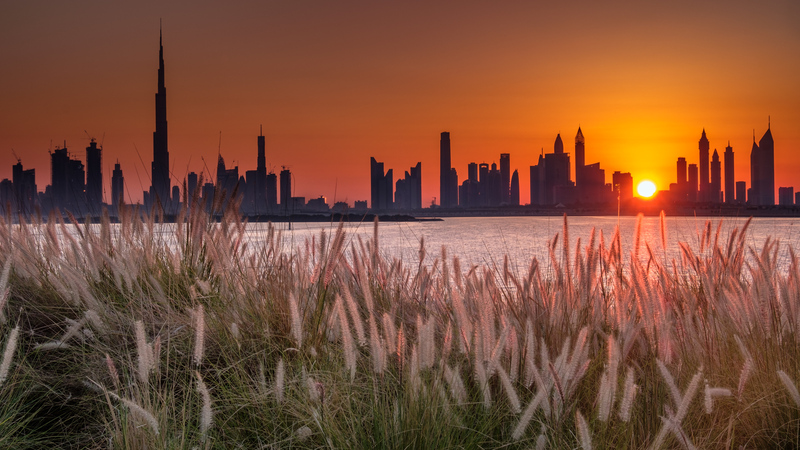 Given the UAE landscape photography scene is at its yearly low due to the soaring humidity and temperatures, it is a perfect time to start releasing them! 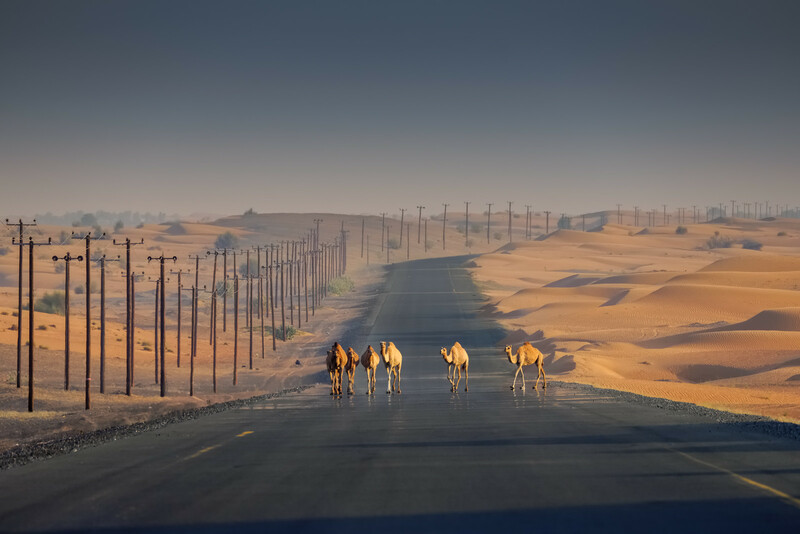 That was until I saw a group of camels coming out of the desert and taking a left onto the road towards me. The sun was setting on my right hand side and provided me with some dramatic evening light. Right place, right time, I guess! I'm really enjoying shooting the XF 100-400 lens together with the latest X-series body (X-T2); especially with the Power Booster (Battery grip), it makes for a great duo! 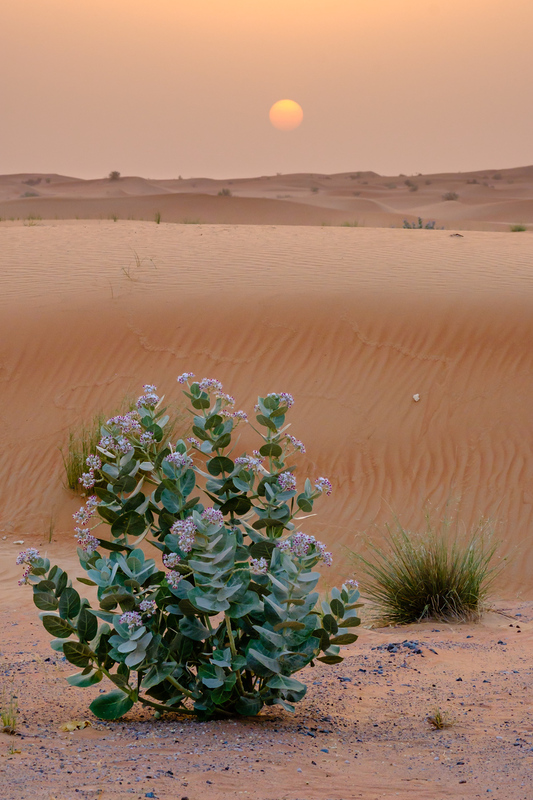 More images of the Nature of the UAE, can be found here. 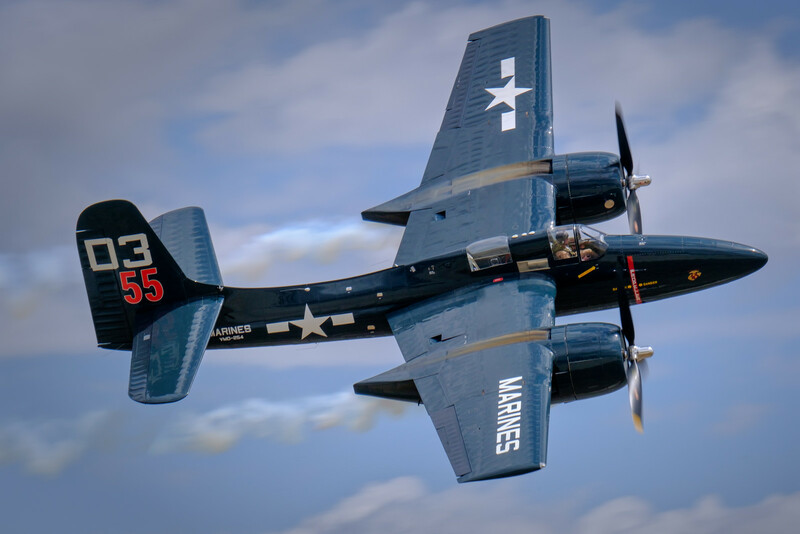 A few days after I was given a early pre-production Fujifilm X-T2 camera (then still called Taurus), I attended the Planes of Fame airshow in Chino, Southern California. 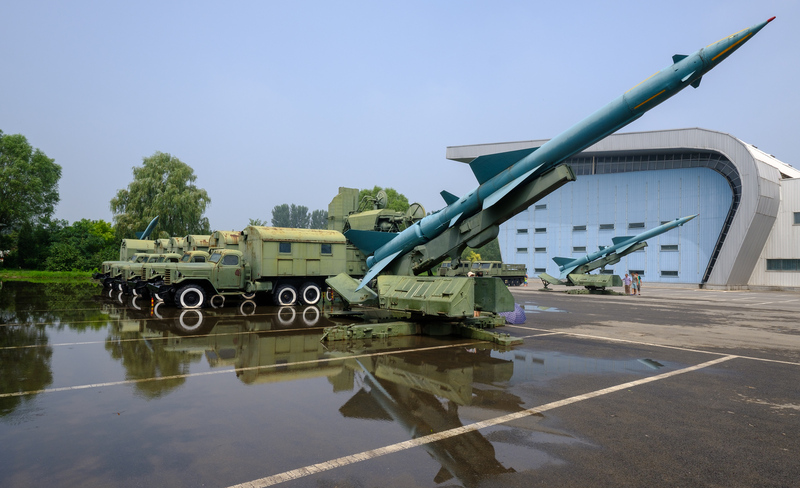 It would be its first real life test at an international airshow and it didn't disappoint! 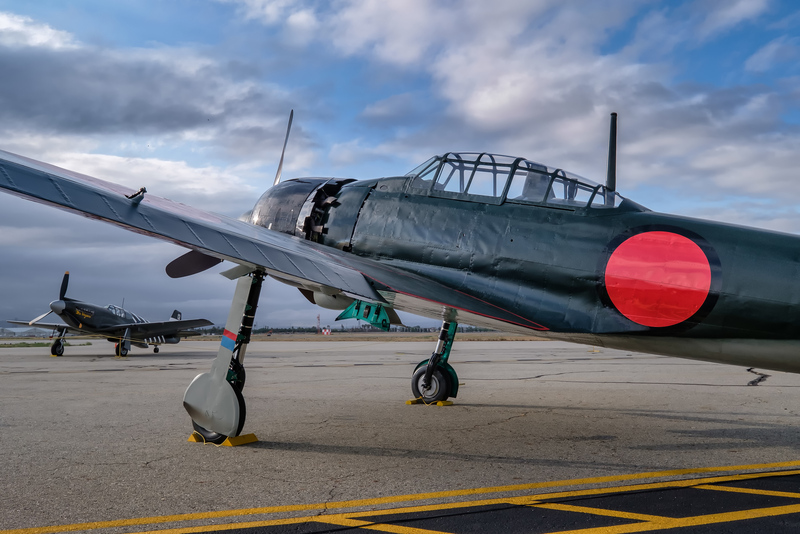 One of the other stars of the show, was a recently restored Mitsubishi Zero fighter plane. 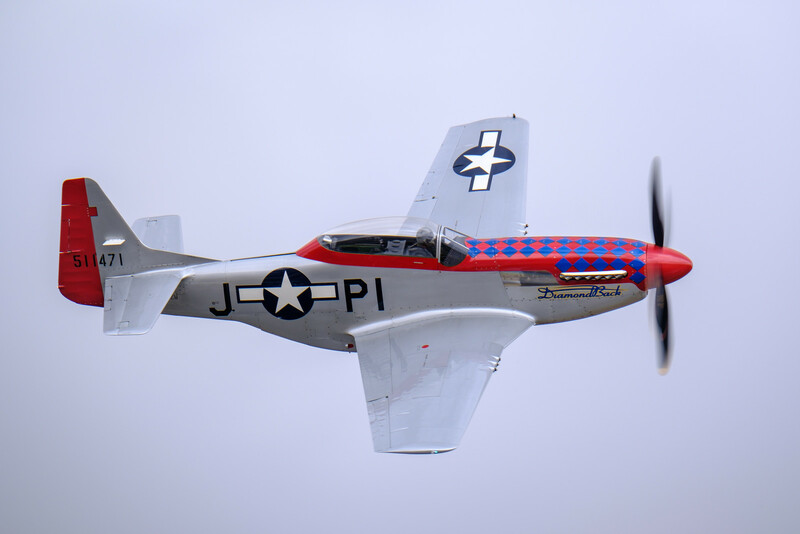 The aircraft did its first flight a few days before the show weekend and is one of only a handful in flying condition all over the world and is the only one still flying with the original Japanese Sakae engine. A very rare bird! 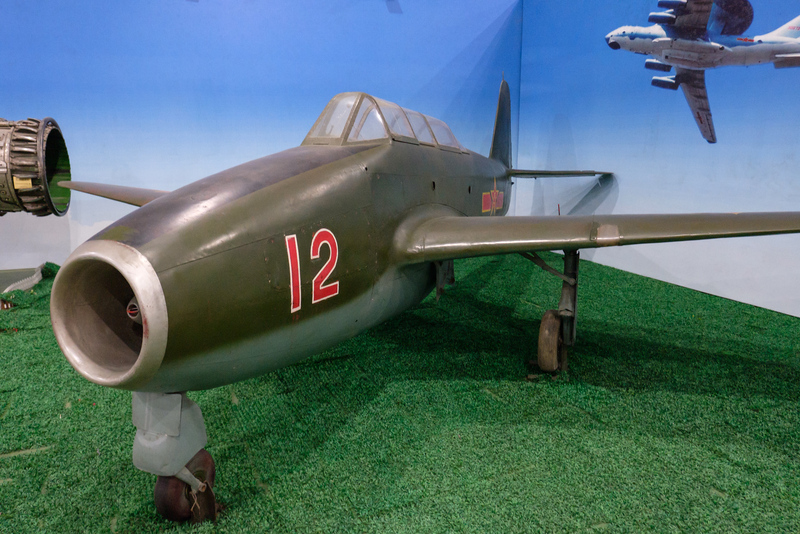 When the Mitsubishi Zero first came out in 1940 it was feared by a lot of the Allied pilots in the Pacific war scene; much lighter than its counterparts, it had great firing power and was very simple to operate... Reminds me of the just released Fujifilm X-T2 camera; light, lots of firing power and easy to use! More images of the 2016 Planes of Fame airshow can be found here. EID MUBARAK to my muslim friends all over the world! Now that the crescent moon has been sighted, it marks the end of the yearly Ramadan; a yearly month where most Muslims are fasting from dawn till dusk. Eid-al-Fitr, the feast of breaking the fast, is an important holiday celebrated by Muslims around the globe. But today was a double special day; it also marks the launch of the brand-new Fujifilm X-T2, which has been launched on July 7th! In case you missed my review, make sure you check it out on this blog here. 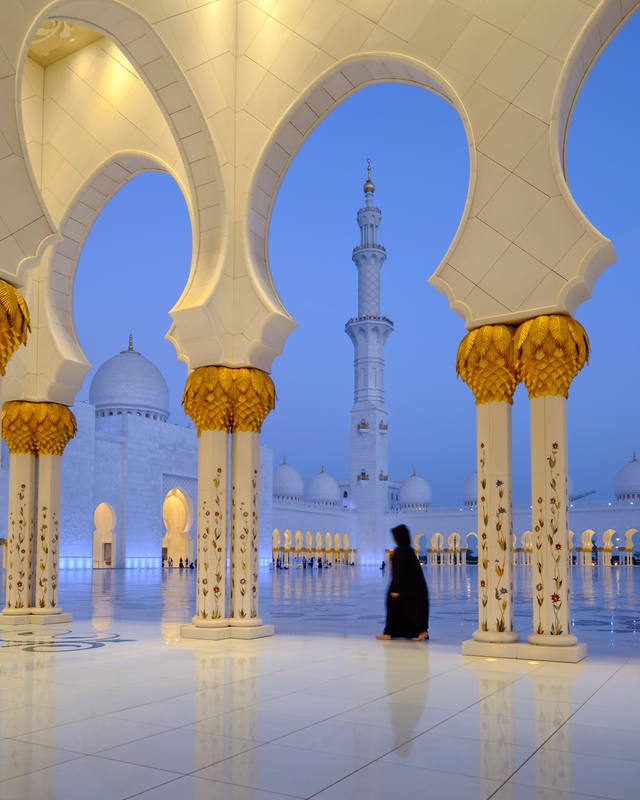 The image below was shot at the Sheik Zayed Grand mosque in Abu Dhabi, a beautiful piece of architecture that can hold up to 40.000 worshipers. 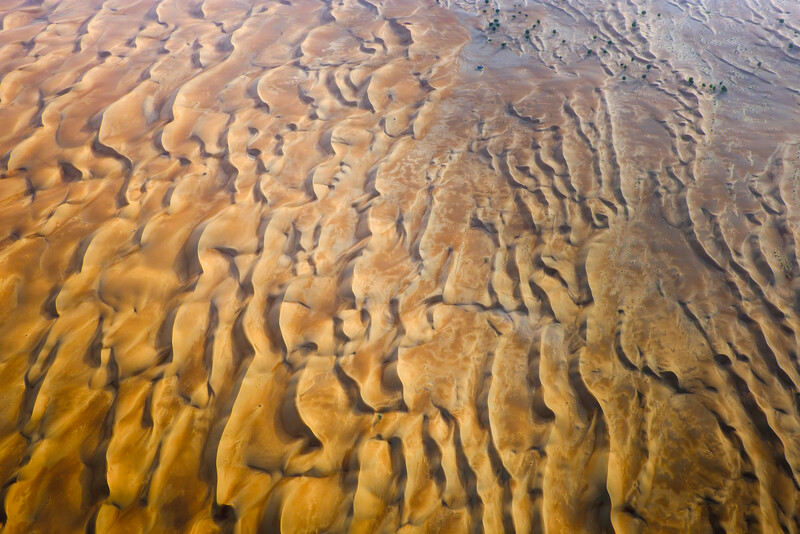 More images can be found in my Architectural Abu Dhabi gallery. 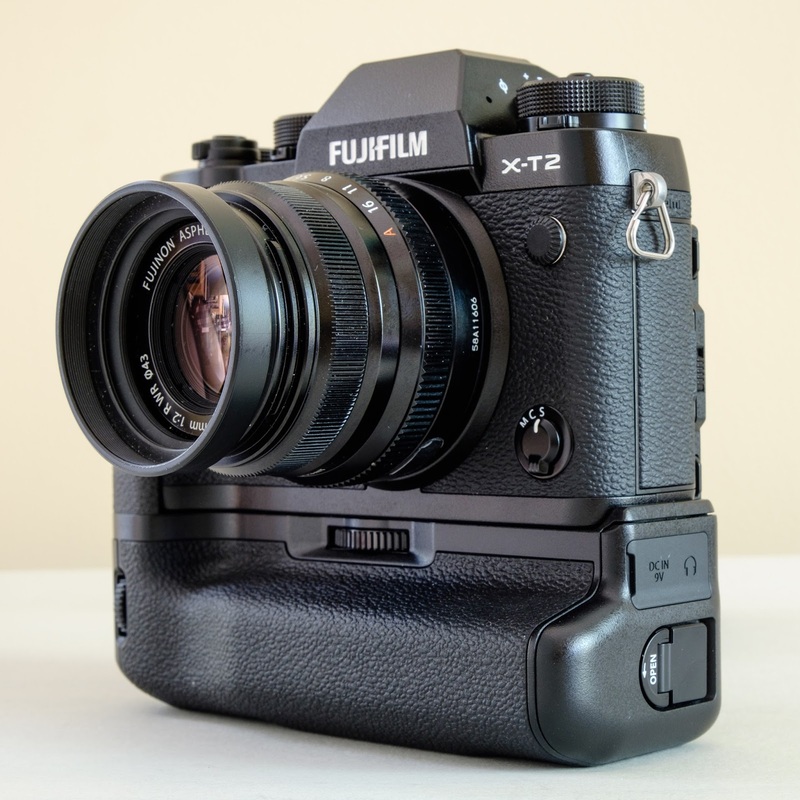 In Part 2 of my First look review of the Fujifilm X-T2, that has been released today, we will have a look at the image quality of the latest X-series camera! At the end I will give my initial thoughts and conclusions. Part 1 can be found here. Since I picked up my "pre-production" copy of the X-T2 end of April 2016, I've been taking the camera to a lot of different places over the world. 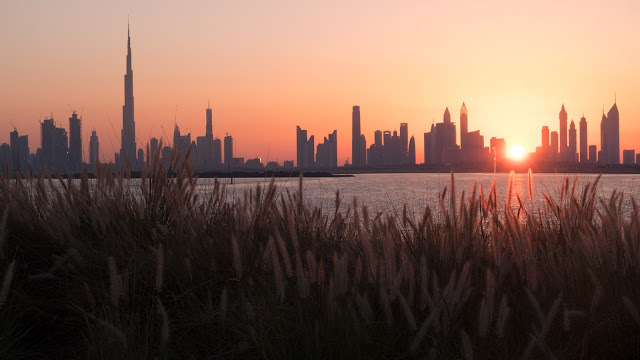 But one of the first shots I made, was this post-sunset shot below from a new project called "The Terrace- Dubai Creek Harbour" at the end of Dubai Creek. 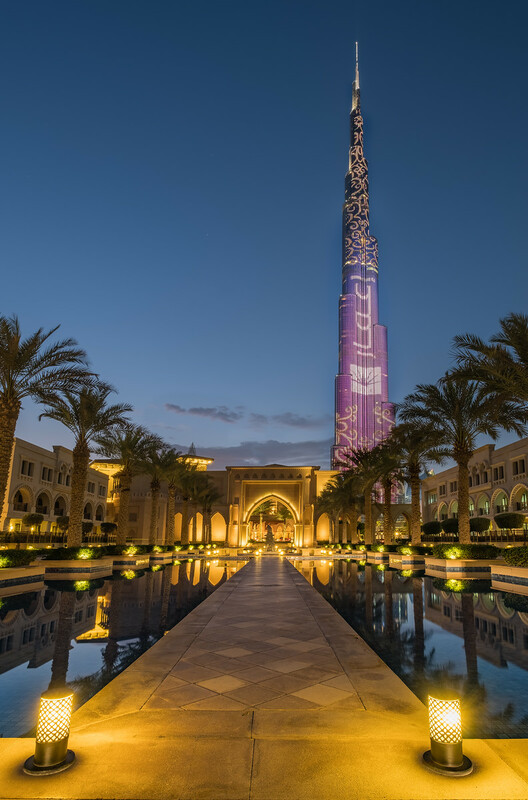 A second image where three images were blended together was this one of the Burj Khalifa during the blue hour from the Palace Hotel. It was made by using the new 2 stop Exposure bracketing, which a lot of photographers have been asking for, for a long time! The dynamic range and especially the RAW file potential of the single files is excellent as well. The image below of a tree in Mauritius is made by adjusting shadows and highlights of a single RAW file in Lightroom. Something that definitively would have been more difficult in the previous generation of X-Trans sensors. If I have to choose, I would rather slightly underexpose and recover in post than the opposite. I've really enjoyed using the new XF100-400 lens when shooting the X-T2; especially with the new battery grip where the combination is really well balanced. 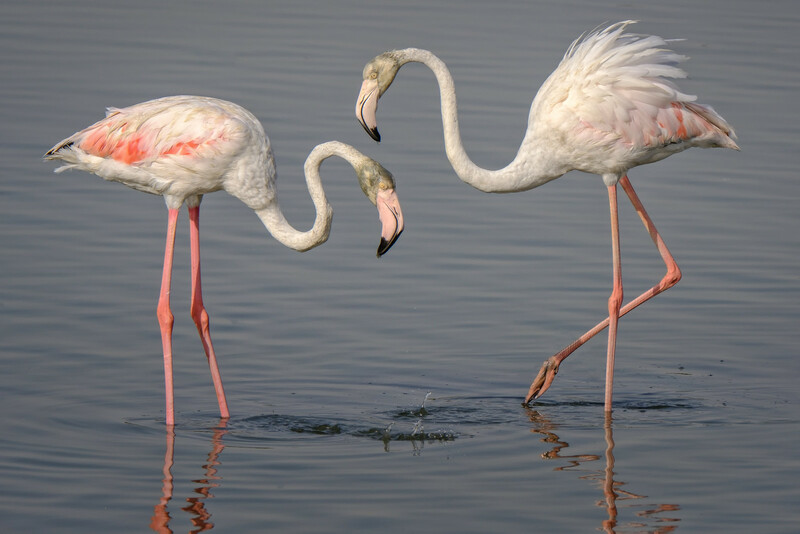 Below are a few sample images from a wildlife flamingo shoot in Dubai. Look at the sharpness! 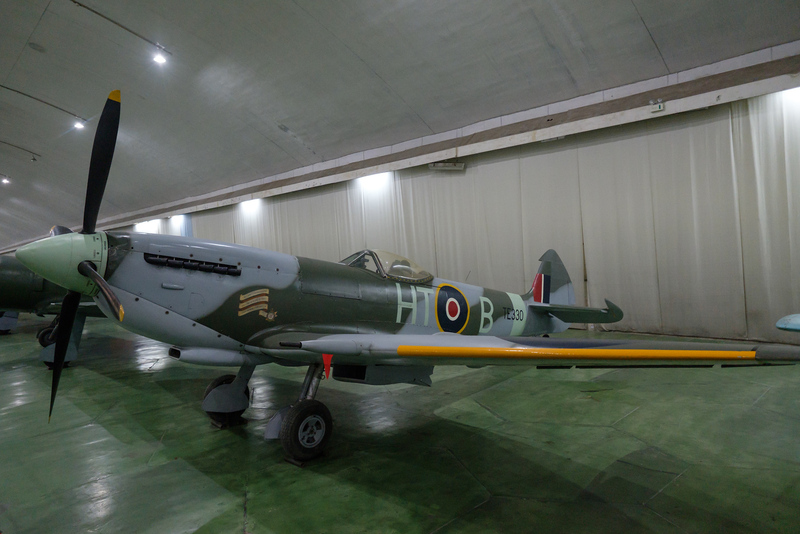 Especially for my Aviation photography, the new advanced focus tracking is the biggest improvement compared to the X-T1. Although the firmware was still not final when I shoot the Planes of Fame airshow end of April, I came home with lots of great images! 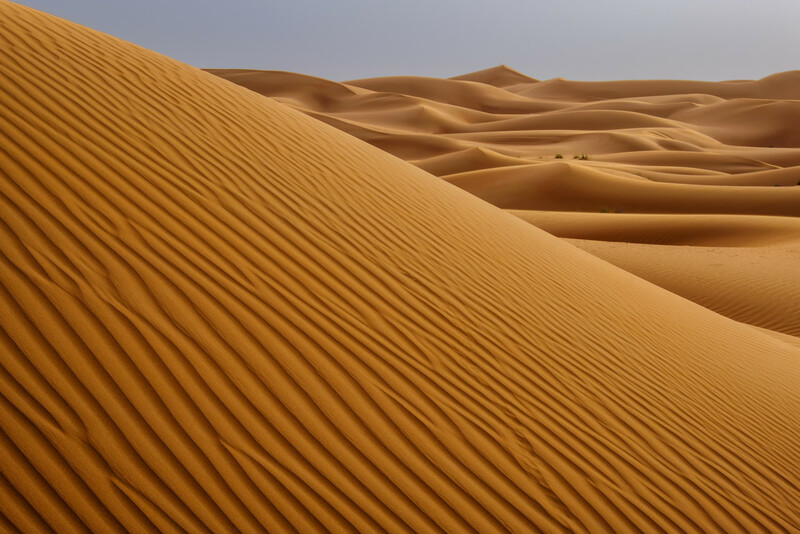 I shot the camera in harsh desert conditions; strong winds with blowing sand and temperatures over 40C, with absolutely no problems. I'm not a pixel peeper, but have really been impressed with the amount of detail the X-T2 files reveal; both with the in-camera jpegs and with the RAF (RAW) files. It looks like Lightroom CC deals a lot better with the X-Pro2 and X-T2 files than with the classic X-Trans II files. 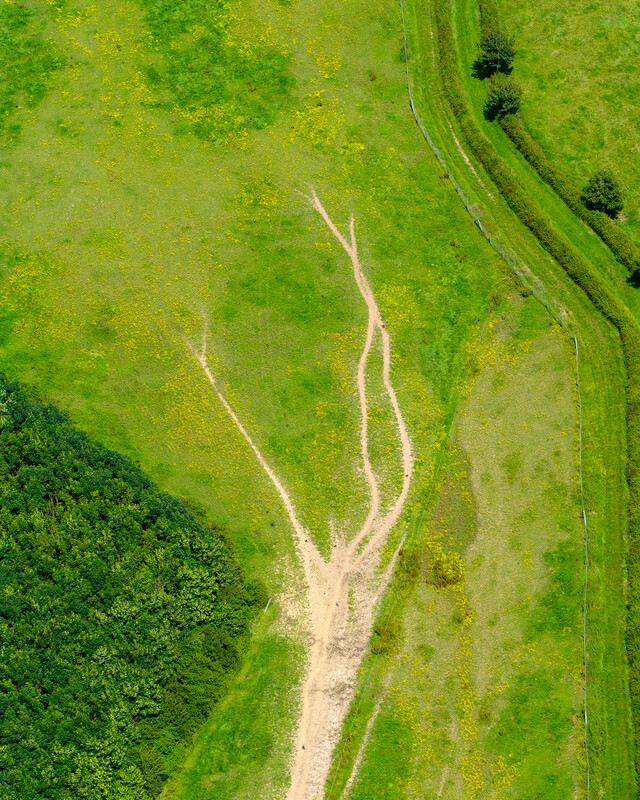 The previous generation X-Trans II sensor images, with a lot of foliage, could sometimes be a challenge to develop to its full potential in Lightroom. The new sensor does not seem to suffer from the same problem. 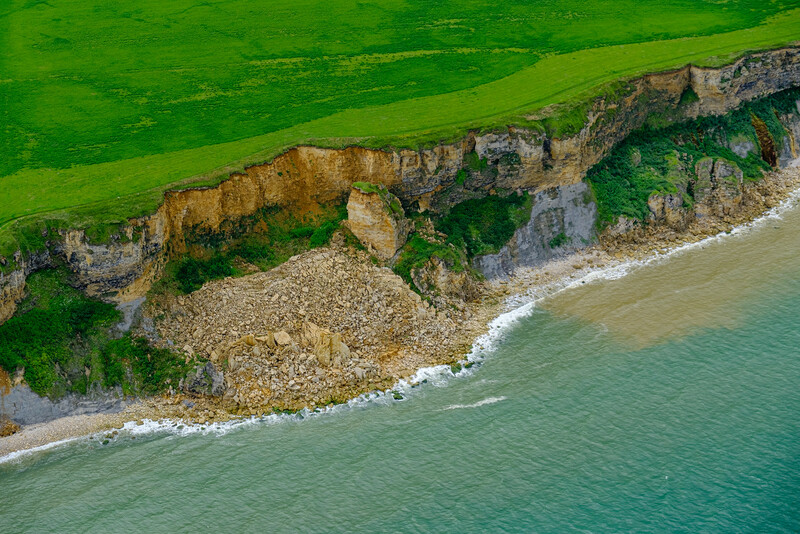 Check out the aerial image below to see the amount of detail. When the X-Pro2 was announced in January 2016, some photographers were sceptical about the high ISO performance of the higher megapixel sensor. In my X-Pro2 review, I concluded that the X-Trans III sensor has about one stop advantage over the X-Trans II and that seems to hold true as well for the new X-T2 sensor. I will happily shoot at ISO 6400, even 8000 with the new camera as long as the image is correctly exposed. Especially when shooting with the smaller lenses like the XF35 f2 or 27mm f2.8, the X-T2 makes for a great street photography camera! I love the tilt screen when hunting for these decisive moments. This is by far the number one reason, I don't own an X-Pro2! 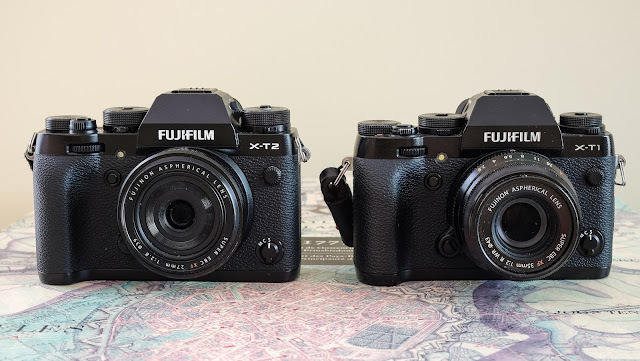 The First Look review of the X-T2 has been largely based around the differences between its older brother. 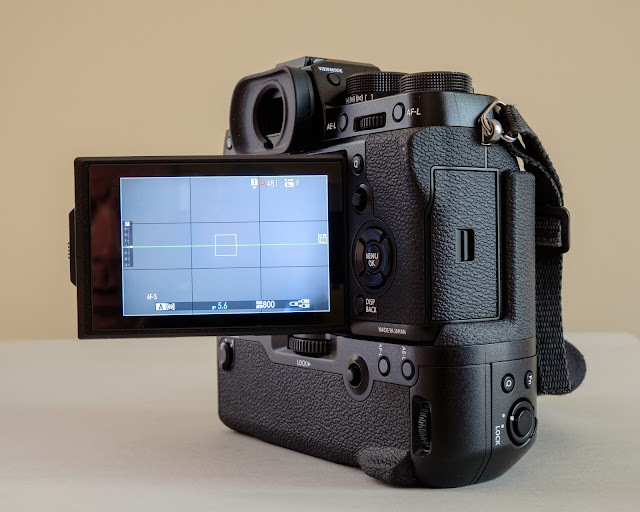 It is important to know that the camera has many more features that are not mentioned here; items like the built in WiFi or great film simulation modes have been part of the Fujifilm X-series for a while. 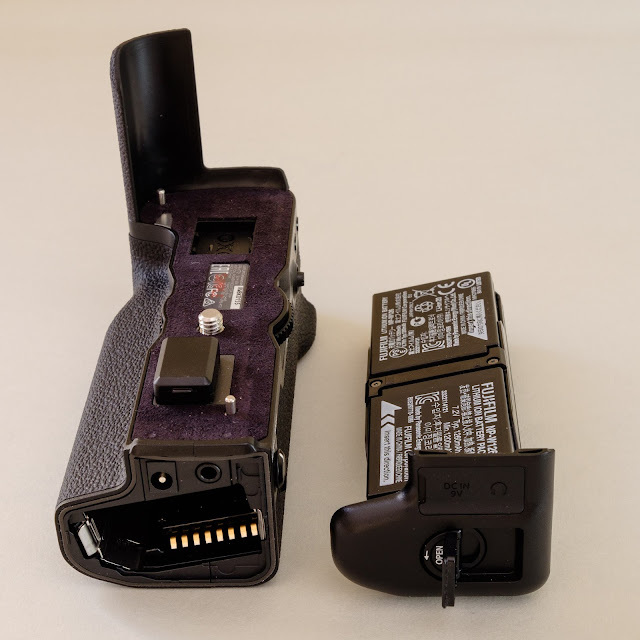 Negative points on the X-T2 were very hard to find; there were a few smaller items with regards to the battery grip (see part 1 Battery-Battery grip), which I suspect will be solved by the time the cameras becomes available. Yes, a touchscreen would have been nice, but that would have undoubtedly increased the price point. Beside the new "joystick" is working great, almost making a touchscreen just a gimmick. Still on the LCD, I have liked to see the screen rotate to the 180 degree mark, something that video shooters love. I stated before that the camera I used for the review, was a very early pre-production copy, which I got more than 2 months ahead of the announcement date. Given the firmware was not final when writing the review, I was not able to go into detail of the new updated autofocus tracking system and other new features. I will therefore blog again about the missing items before the camera becomes available in September 2016. What I do know is that I really believe the X-T2 will be another "high flyer" for Fujifilm. No, I'm not paid to make that statement, but I'm confident that this camera will pull even more DSLR shooters over to the mirrorless camp. Even without having seen the full potential of the X-T2, I'm sold. For 1600,-USD I want one! 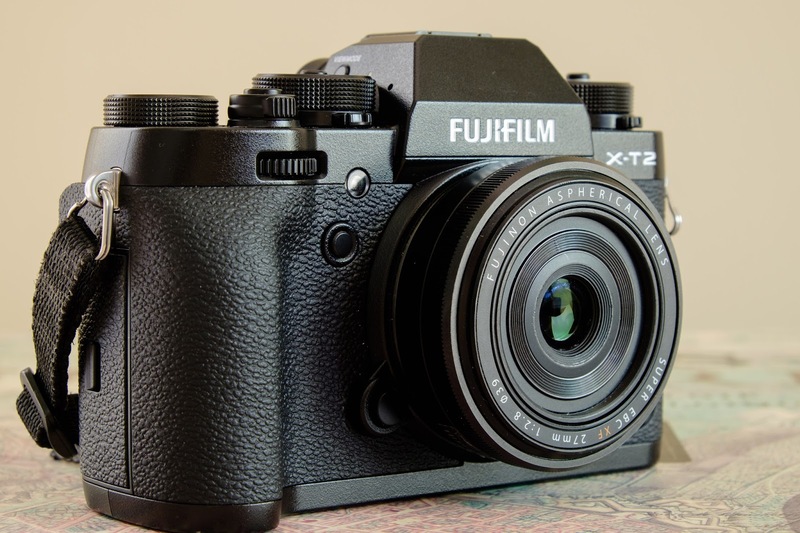 Just over two and a half year ago, FUJIFILM announced the X-T1, a mirrorless "DSLR like" camera, which made a lot of pro-shooters exchange their DSLR's for X-T1's. Almost to the day two years ago, I was one of them! My very popular Bye Bye Nikon, Hello Fujifilm post talks about that big step! Since the launch of the X-T1 we have seen quite a few firmware updates, often giving the camera complete new functionality, such as the new autofocus system released with the ground breaking firmware 4.0 update. Although the X-T1 is still very capable, once Fujifilm announced the new X-Pro2 in January 2016, the rumours started building that an X-T2 was in the making... Today the waiting is finally over! The X-T2 has been announced! Lets first go back a few months to April 21. On that day, I received a black box from Japan which had my name on it. Inside I found an early pre-production copy of the X-T2! Completely taped up its secret codename was "Taurus". While initially the camera had a basic firmware based on the X-Pro2, a number of pre-release firmware updates gradually made it to the X-T2 that is announced today! While most of the firmware updates were installed were relatively easy to install, the last one had to be done by a Fujifilm qualified engineer... A bummer as I was travelling in that period and therefore could not be done before release date. Briefly, as of today I have not seen the final version of the firmware, although it was pretty close! So although not limited to it, the review below will concentrate a bit more on the ergonomics rather than an in depth firmware review of this great new camera. Overall the new X-T2 looks and feels very much like its predecessor. 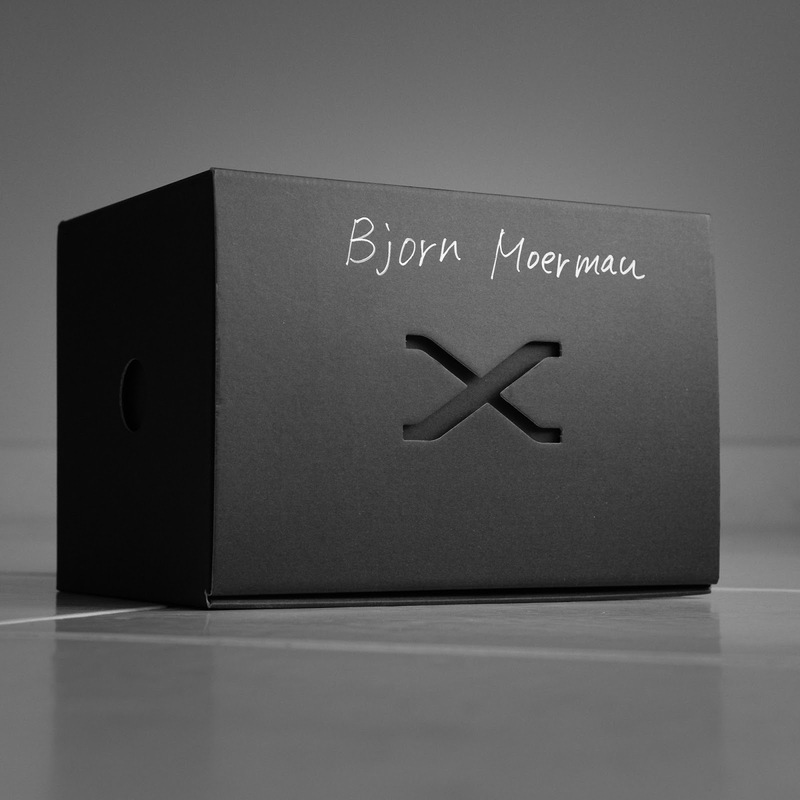 Actually while shooting the prototype over the last two and a half months, not a single person spotted a "new" camera, while quite a few thought I was just using an X-T1. The grip on the front right is ever so slightly more pronounced than on its older brother, making for great natural handholding. It has the same "DSLR like", look with ISO/drive dial on the top left and Shutter speed/Photometry and exposure compensation dials on the top right. Obviously the camera is weather and dust resistant just like its older brother. The body is made of magnesium alloy. The largest change which is not immediately apparent, is the update to the new 24.3MP X-Trans CMOS III sensor. Although the same pixel count as the X-Pro2, the new sensor seems to be slightly different; at least that is what I was told by Fujifilm. More details were not known at the time of writing this post. Just like the X-Pro2, the camera also has a new processor, the X-Processor Pro; which provides plenty of horsepower making the camera snappier and very responsive. Although hardly noticeable the X-T2 is ever so slightly larger than its predecessor; 5mm wider and 2mm more in height and depth. Its weight has slowly crept up as well; with battery from 440g to 507g; almost identical of the X-Pro2 weight (495g). I suspect the increase might have something to do with the need for better cooling for a more demanding processor and its 4k video capability. Staying with the top dials first, all of them are about 20-25% taller and both the ISO/drive and shutter speed/Photometry now have a "push to lock" button on the top. They rotate smoothly with just enough friction and the lock function is a great addition against involuntary dial movement. Just like the X-Pro2 the exposure compensation now has a +/- 3EV with an optional extension to 5EV using the Custom C setting. Also taken from the X-Pro2 is the new Photometry "Center Weighted" mode; beside the existing Multi, Spot and Average, this one measures the entire scene but gives a bit more weight to the area in the center of the frame. We are seeing the return of a threaded shutter button, which will will take an old style cable release and will easily allow for a screw on "soft release button"; something I've fallen in love with, on my X-T10. The flash sync speed has been extended from 1/180s to 1/250s; a welcome addition for photographers using speed lights with the X-T2. 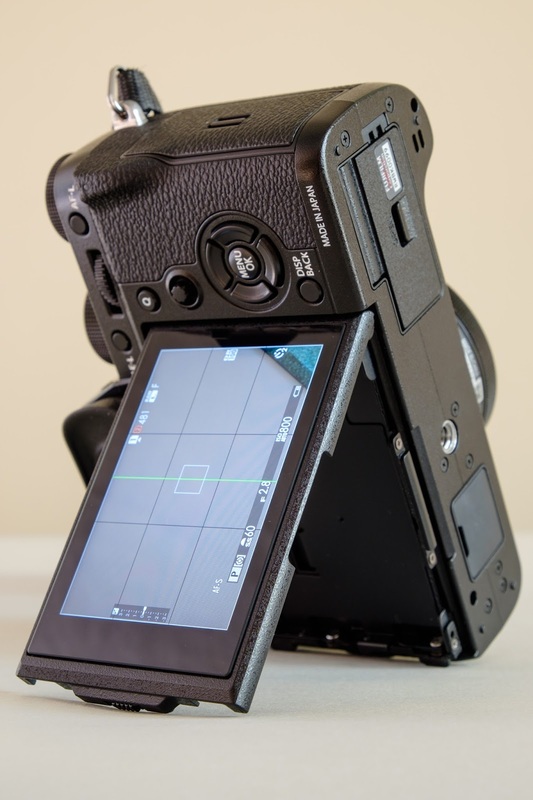 The backside of the body features the new X-Pro2 style "joystick", a great addition and clearly something that one misses the most when going back to the older cameras like the X-Pro1, X-T10 and X-T1! My number one complaint about the X-T1 were the fiddly D-pad buttons; they were clearly too much recessed and were hard to press; probably just fine for the average Asian photographer, but not for us Westerners. The X-T2 now has a 4 way controller (D-pad) which has great feel and functionality. Even when keeping your eye to the viewfinder, one can still use the joystick without any issues. Both the front and back dials can now be pressed; the back one becomes the focus assist while pressed, while the front one can be set up as a function button. The Q button has moved to the place of the old "focus assist" button, while the new joystick is where the old Q button used to be. All other buttons remain pretty much in the same position. The tripod mount on the bottom, now sits in the centre, which makes finding the nodal point for panoramas much easier. The XT-2 has a brand-new battery, called the NP-W126S. Externally it is exactly the same in size, but has been optimised for use with the X-T2 through its "third pin". Even though it is also a 1200mAh / 8.7Wh battery, it provides more shots per battery, uses the energy much more efficient and seems to deal much better with avoiding overheating. The old batteries do also fit and work with the new camera. Battery chargers are interchangeable. When selecting the Display mode that shows the histogram, the battery percentage shows in digital form; the same like on the X-Pro2. There seems to be a much more linear drop-off as the battery reduces in charge; unlike the previous generation X-series cameras where the battery symbol would often drop from one block left to empty in only a few shots. Also new to the X-T2 is the VBP-XT2, called by Fujifilm the Vertical Power Booster Grip. It now takes two batteries (both old or new) and has a 3.5mm headset jack as well as a 9V DC IN power connection, which is perfect for studio work. All main buttons, such as a Q button, two scroll wheels, AE-L and AE-F button and the great new "joystick" are duplicated on the grip. The batteries in the grip are called, L and R; however when one slides out the grip, facing forward, L seems to be the one on the Right and vice versa. No big deal! On the left bottom of the grip there is a handy Normal/Boost switch, which allows for higher frames per second in CH (from max 8fps to 11fps), improves autofocus speed and shortens the shutter lack. The battery being used first seems to be a bit random; sometimes the battery in the body discharges first, other times it seems to be a partial discharge in the body plus one battery in the grip... I'm not sure if this will be addressed in the final production firmware and will report here as soon as I have more info. Ideally I would like to see a menu setting in which one can choose which battery will discharge first. Alternatively, a setting where the batteries in the grip are discharged first would also work. 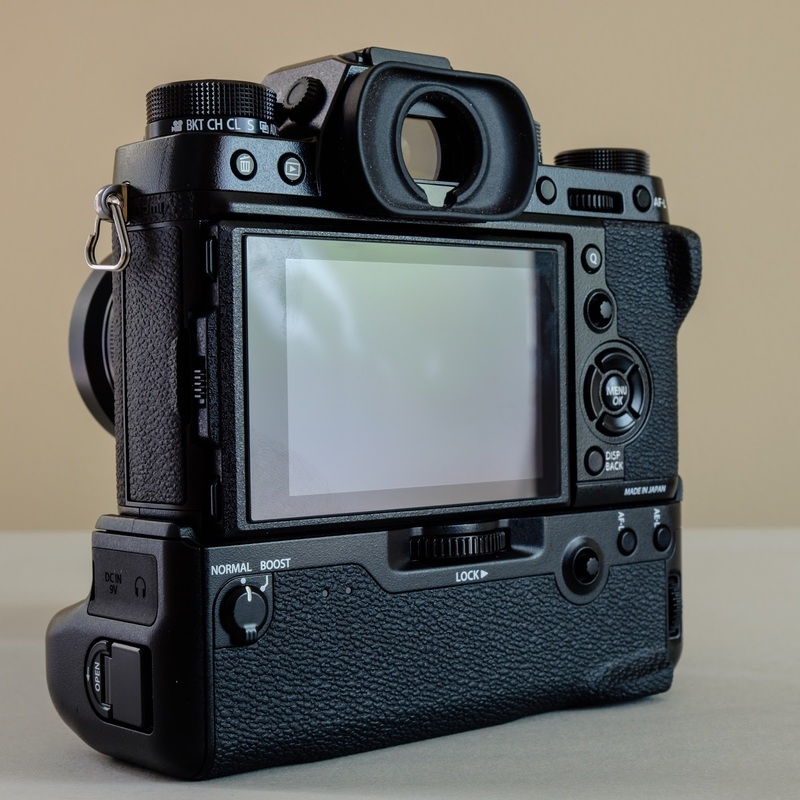 After some extensive use, especially in hot and humid climates, the X-T1 has a common problem where the left door started to flex and doesn't close completely anymore. Its younger brother has a much more sturdy door, which I'm confident will not develop the same fault. Inside the left door, one now finds 4 instead of 3 connection ports; for a 3.5mm microphone jack, a full size USB 3 port, HDMI port and a 2.5mm remote port. The camera can be charged through the USB 3 connection. The memory card door on the X-T1 always felt it bit flimsy and would sometimes open by itself. This one seems also to be fixed by using a harder door and a much better locking mechanism. 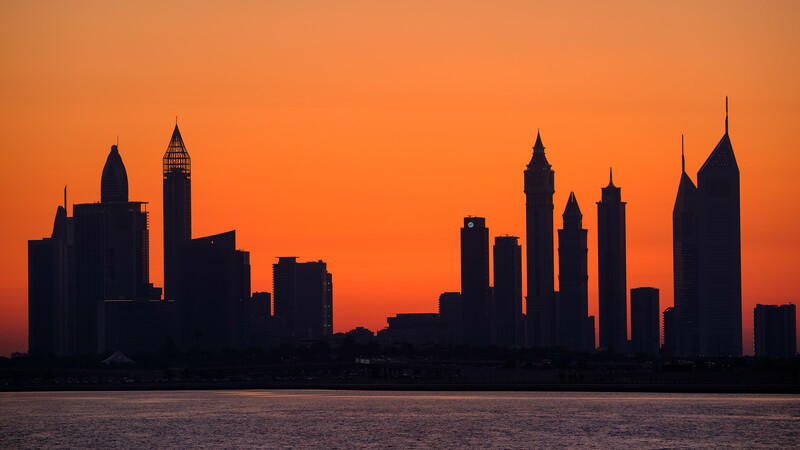 Lastly, most of the rubber skin on my X-T1 was coming loose after about 12 months of use in a hot and humid climate like Dubai. 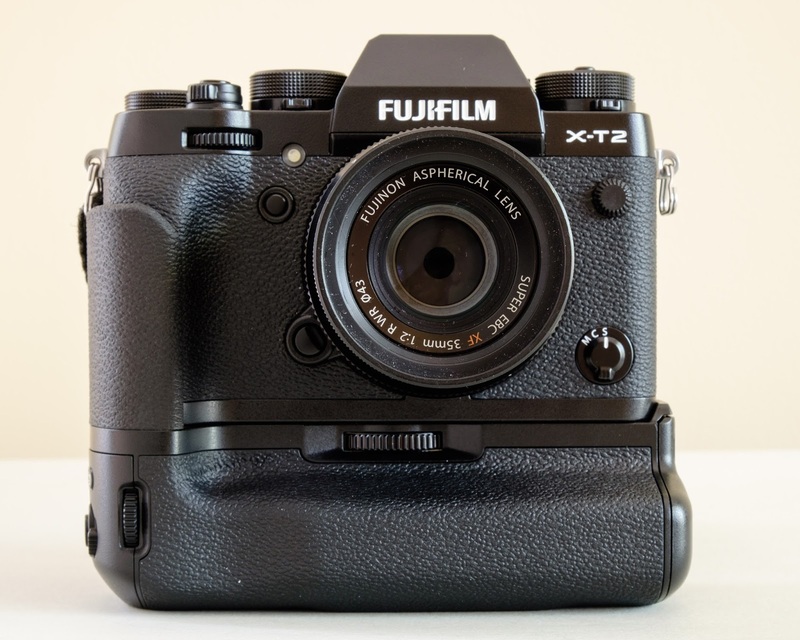 Fujifilm has confirmed that the material used on the X-T2 is indeed of a better and slightly harder quality. Of course only time will tell, if this indeed works better. The rear LCD is now a 3 inch 3-axis tilt screen; it not only tilts around the traditional up/down axis, but now also can be tilted sideways. However, it doesn't swing all the way around, something that video shooters will miss. The only time I can see the 3th axis being useful is for low and high perspectives when shooting in a portrait orientation. To use the new side-tilt position, one needs to unlock a small latch on the left hand side of the screen. Just like the X-T1 the Electronic Viewfinder is one of the strongest points of the camera line. It has kept its 0.77 viewfinder magnification (0.59 for X-Pro2) and has a 2.36M dots resolution, keeping the 100% viewing versus capturing area. The maximum viewfinder refresh rate has been increased to a 100fps (using Boost mode), leading to a much higher refresh rate. All arguments against EVF's can now be completely put to sleep! The camera comes with an extended "semi long eye cup" on the viewfinder. Although not as long as the optional eyepiece accessory Fujifilm is selling for the X-T1, it is clearly longer than the standard X-T1 eye piece. Presently I don't see a need for me to buy the optional eyepiece for the X-T2 whenever that becomes available. Double memory card slots are often seen as a pro-feature and they certainly should be! Especially for photographers who are shooting once in a life time events such as weddings, travel-expeditions and special events, having an in-camera backup is very important. Beside the automatic back-up in slot 2, one can also choose to shoot RAW in slot 1 and jpeg in slot 2; this is my preferred way of using the system. Third option is the sequential shooting, where the next slot will only be used once the first one is full. Movies can either be set-up to go to slot 1 or 2. The good news is that unlike the X-Pro2, both memory card slots, support the faster UHS-II cards; great for people that want to record 4K video on a separate "fast" card. The lossless compressed RAW files will be my new future image size, as I can not see any difference between the compressed and uncompressed files. Strange enough, when converting a lossless compressed RAF file to DNG, the size increases, rather than the usual 10-20% reduction. For the moment I have therefore stopped converting to DNG. The X-T2 has a new shutter allowing for a 1/8000s maximum Mechanical shutter (MS) speed compared to the previous 1/4000s. The Electronic shutter (ES) allows to shoot 100% silent (no only quiet but no sound!) till 1/32000s. It does however has the disadvantage of possibly giving some image distortion due to "rolling shutter" issues. Having a new mechanical shutter also means that it comes with a new sound. What is the big deal, I hear you say... Well it is a bit like driving a sport car with great engine noise; does it makes the car better? Probably not, but it surely makes it great to drive! Compared to the X-T1 it has a much better sounding shutter; although not identical, close to the X-Pro2 one. A week after getting the prototype X-T2 (end of April), I took the camera to a large warbird airshow in California (Chino-Planes of Fame). Even though at the time it still had a basic firmware (largely a copy of the X-Pro2 firmware at the time), I did notice a vast difference in autofocus speed and tracking compared to the X-T1, I was also shooting on the side. The most notable difference was the lack of black-out in between the images. Beside, the new processor seems to be doing a great job, allowing one to shoot multiple bursts without the camera freezing up. Especially when shooting sport or other fast moving subjects, I do recommend using fast memory cards to take advantage of the higher writing speeds; anything above 240MB/s seems to be working great. I was able to get very close to the maximum 83 jpegs and 27 RAW images before the buffer fills up. More than enough for most sport shooters! The number of autofocus points has been increased from 91 to a whopping 325 points; even more than on the X-Pro2! To make selecting a focus point easier, one can reduce to a max of 91 points, which for most shooting situations is plenty. An increased 40% of the imaging area is now covered by phase detection autofocus pixels; great for autofocus tracking. The X-T2 released today, also has an AF-C Custom menu setting, where one can "fine tune" the Continuous Autofocus setting, depending on the conditions. I'm not aware if any other mirror-less camera has this feature, but I certainly think it is a great idea! After all some of the top-end DSLR's have it as well. The menu has 5 different settings including a custom setting, where one can change the Tracking sensitivity, speed tracking sensitivity and zone area switching. Given the complexity, it would make for a great instructional Fujifilm webpage; a bit like "The new AF system"web page after the X-T1 firmware 4 and X-T10 launch. I was not able to test the tuning of the AF-C in real life as this came only shortly before todays launch date. More definitively later! In CH (Continuous shooting High) setting the normal burst rate is 8 frames per second (fps), while this can be increased to 11 fps when using the "power boost" mode on the external battery grip and even 14fps when only using the electronic shutter (no need for the battery grip for that). In CL, three different frame rates are possible; 3, 4 or 5fps. Unlike its older brother, where one would always have at least two shots when using CL, clicking a "single" shot is now easily achieveable. Needless to day that the new Black and White Acros Film simulation modes, often referred to as "Black and White Film for digital", are all there as well! Finally the X-T2 has a +2 to -2 EV exposure bracketing which so many landscape photographers use for additional dynamic range. Just like I wrote in my X-Pro2 review, it is a good start but I would really like to have a -3 to +3 EV range and don't care about the 1/3 and 2/3 stops which are presently available. Having a max of 5, instead of 3 shots would also be beneficial. I've always liked the way how Nikon does Exposure bracketing and would love to see the same here. First, I'm not a video man, but it looks like the camera had a serious video update. It now shoots in 4K at 30P and Full HD at 60P at a video bit rate up to 100Mb per second. The video can be recorded on a separate SD card; either in slot 1 or 2, for a maximum of 10 min and 30 min if using the "Booster"grip. Video shooters will like the fact that it shoots F-log, similar to S-log on Sony's and C-log on Canon cameras. The dedicated video record button is gone; just flip the drive button to video and use the shutter button to start/stop your video. In Part 2 of the series, we will have a look at the image quality with some sample images and conclusions.